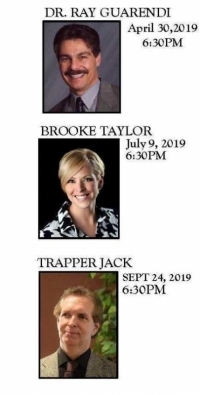 Additional speakers in the series include Brooke Taylor on July 9th and Trapper Jack on September 24th. Please save the dates and plan on joining the parish to listen to these dynamic individuals. There is no cost for these events, however, a free-will offering will be accepted. Dr. Ray will also have some of his books available for sale. The events will take place at Ss. Robert and William Catholic Parish, 367 E. 260th Street, Euclid. Contact the parish office at 216-731-1515 with any questions or visit their website at www.srweuclid.cc.